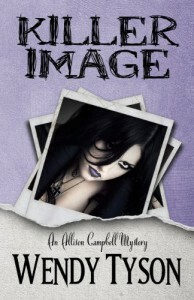 Killer Image is about Allison Campbell, an image consultant. I find that to be a fascinating profession. I think I could use one. This is not a cozy mystery. It's grittier than that. Allison Campbell gets involved with a murder investigation when her former mother-in-law's divorce attorney is killed. That seems a long way around to get involved but the divorce attorney has also represented a number of Allison's clients and she had worked with his ex-wife. There are a lot of overlapping relationships. I'm finding it hard to describe the plot for some reason but it wasn't because I didn't enjoy the book. I really did. I will put out the warning that there is quite a lot of discussion of Wicca. I know there are people that will want to know that before reading. I liked the secondary characters as much as I liked Allison. Her employee, Vaughn, and his brother were two of my favorite. All of what will probably make up the regular cast of characters in this series were likeable. The bad guys were definitely dislikeable. There was a too much amateur investigating without bringing the police in on their suspicions which is why it is 4 stars instead of 5. It had good atmosphere and I'll be anxious to see where these characters go next.